After seeing our family’s singing debut (with the happy birthday video we made for Timothy so could see & hear us singing to him from the other side of the world) our friend called me, Mama Lolli Pop. I already have a mousy voice — but increase the speed of a video a few notches, and I really have a mousy-lolli-pop voice. 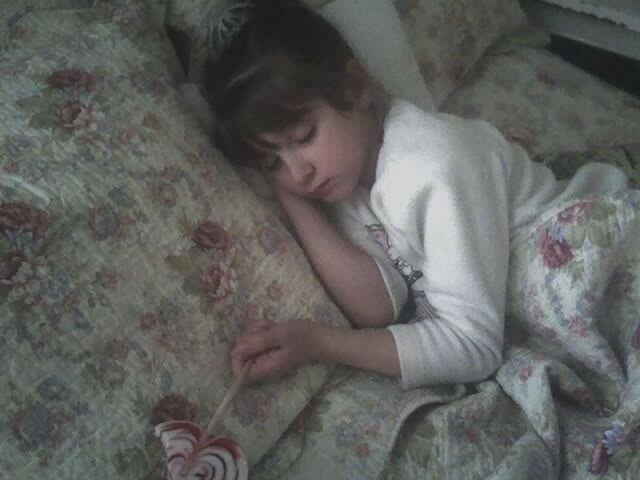 Well, then, I just had to share a pic that makes me smile – the lolli pop is totally and completely coincidental!! Samuel and Hannah had walked to First street… looked through some of the antique shops and ended up at Sammie Jo’s candy store where Samuel bought a lolli pop. It proved to be too much for him, so he passed it on to ‘melia. I didn’t realize she was hanging on to it when she went to take a rest… so, couldn’t pass up the photo op when I went in to check on her. so, I guess this makes her — baby lolli-pop?